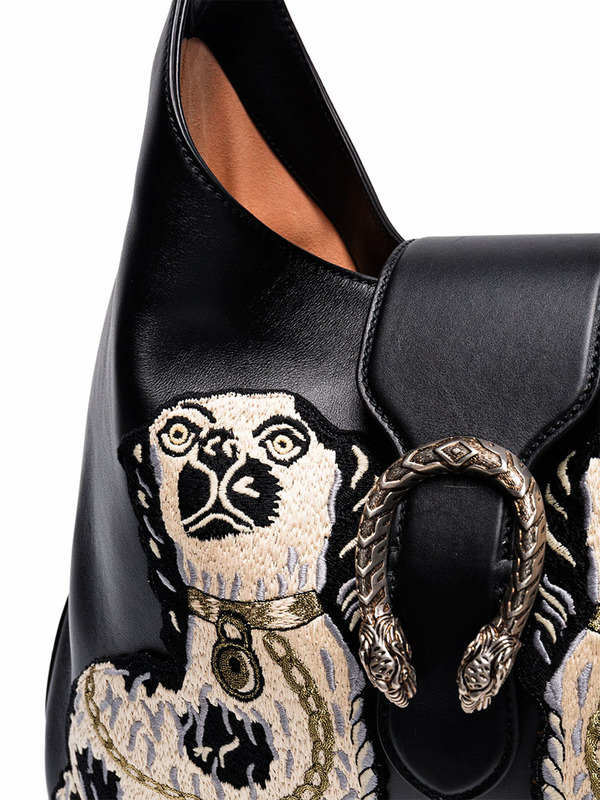 Alessandro Michele has transformed the house of Gucci with bold prints and graphic motifs while staying true to the brand's house codes. Exemplifying the designer's love of nature, this Broche beetle print top handle bag from the AW17 collection has been crafted in Italy from smooth black calf leather. 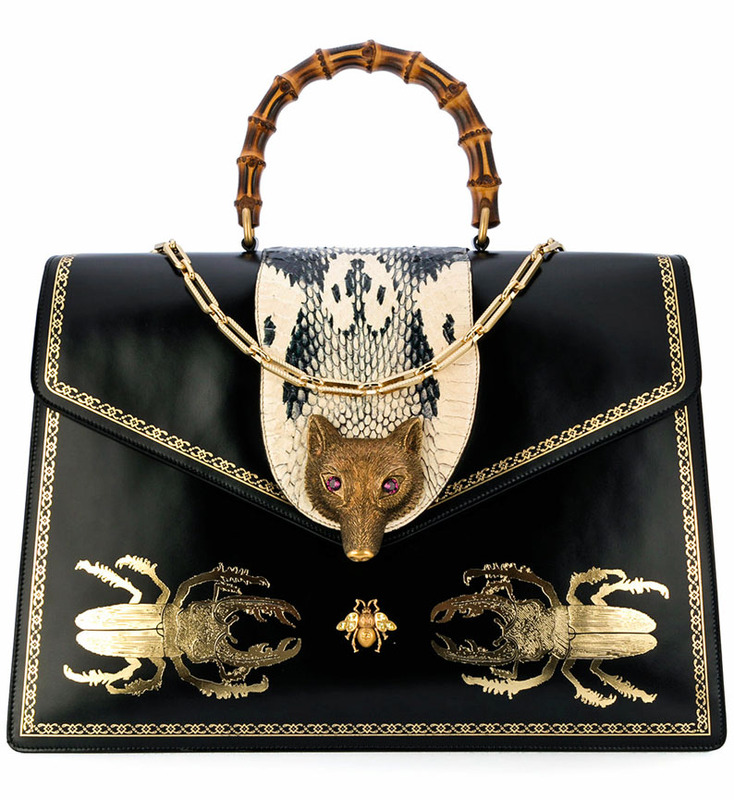 The striking piece features an optional chain shoulder strap, a foldover top with push-lock closure, an internal slip pocket, a bamboo top handle, a cobra-effect front panel with a fox head embellishment, a metallic beetle print and a signature bee emblem. 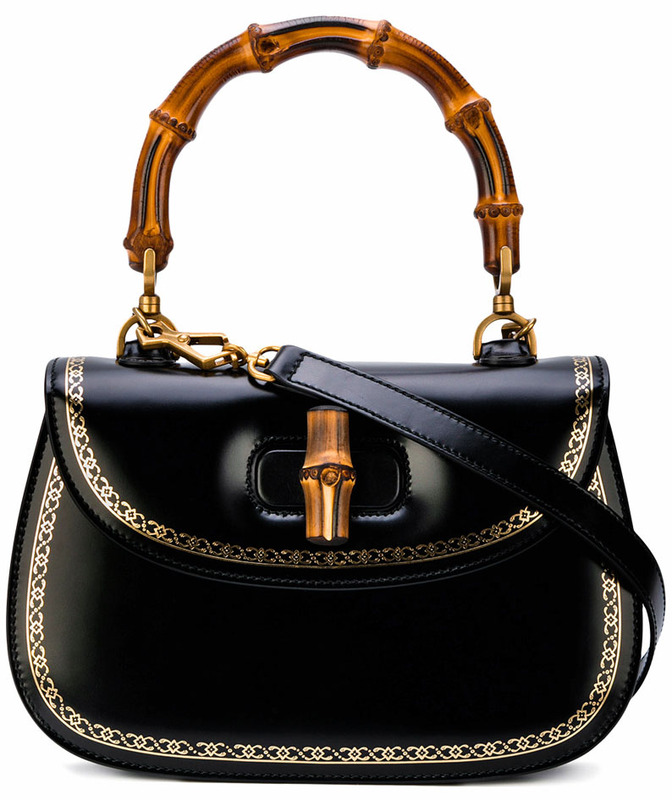 This exquisite Gucci Bamboo top handle bag features a decorative golden frame print border and iconic Bamboo detailing. 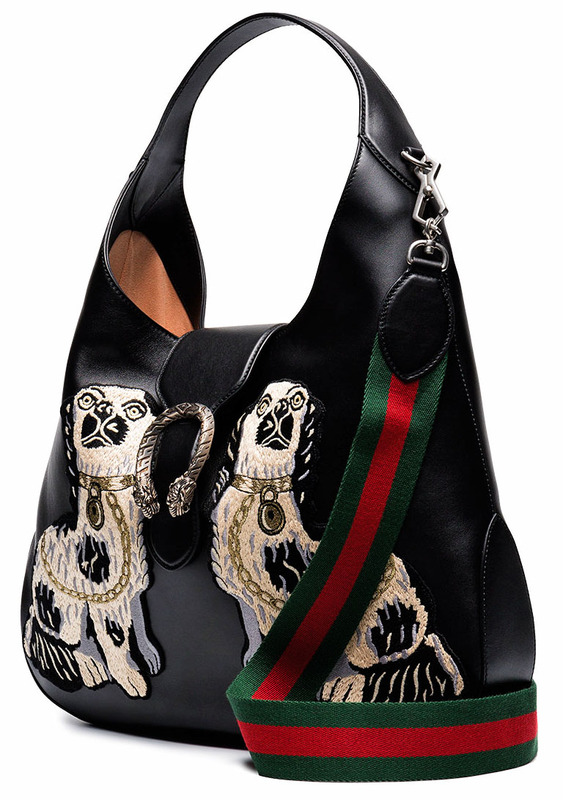 Fastening with a twist lock foldover top, this structured bag benefits from the addition of two interchangeable shoulder straps; one a thin leather version and the other an adjustable strap with Gucci's signature red and green Web motif. The interior is lined with a multicoloured floral print lining, an internal zipped pocket and a logo embossed internal plaque. 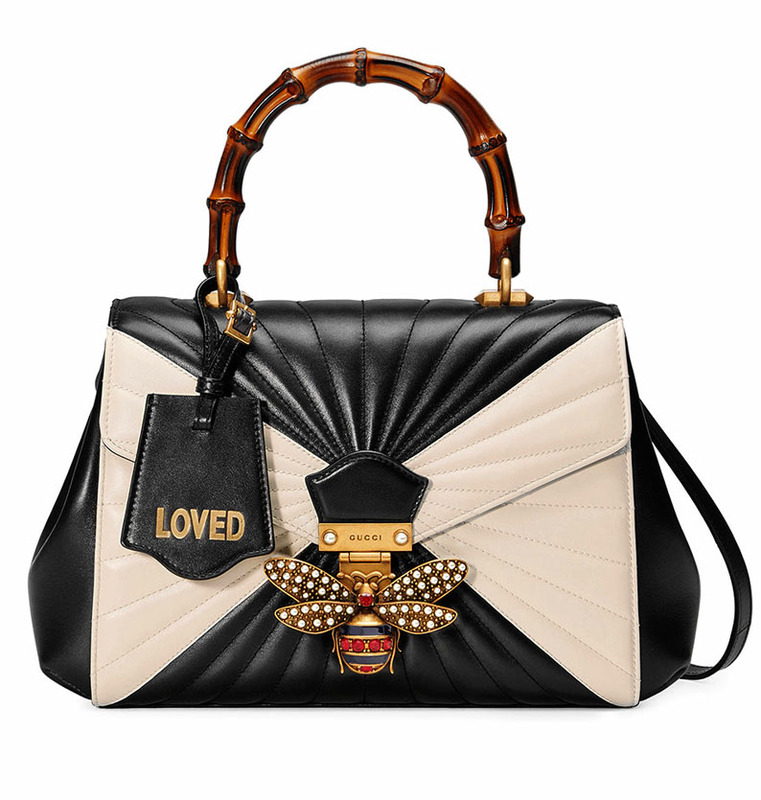 The Queen Margaret line mixes iconic Gucci details with newly established codes. The bee, thought to be a symbol of wisdom and love is enriched by glass pearls and multicoloured crystals. An ID holder with gold embossed "Loved", a reference to inclusive romanticism, hangs over the iconic bamboo handle. Made in a soft quilted leather with a colour block design. Black and white quilted leather. Leather ID holder with gold embossed "Loved". Metal bee with pearls and crystals. Interior zip and smartphone pockets. Reinventing the Gucci stripe and re-establishing the iconic Italian house as one of the leaders in luxury ready-to-wear, Alessandro Michele's innovative vision has elevated the Florentine maison to cult status. Inspired by the Greek god Dionysus who is said to have crossed the river Tigris on a tiger sent to him by Zeus, this large hobo bag is crafted from black leather and features distinctive silver-tone tiger head hardware, a magnetic closure, a round top handle, a detachable and adjustable webbing shoulder strap, an internal zipped pocket and an embossed internal logo stamp.